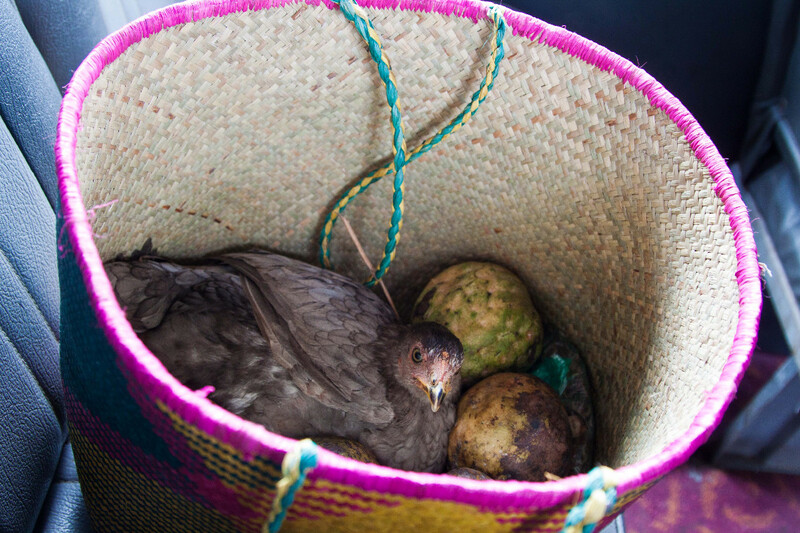 Travelling in Madagascar is not easy. First of all the roads are really bad at times. If not pierced by huge potholes, the streets are often just plain, bumpy dirt roads that my German mind would normally imagine only 4x4s capable of conquering, hence prohibiting the vehicles going faster than 20 km/h in those areas. Secondly the road system does not connect most towns with each other. 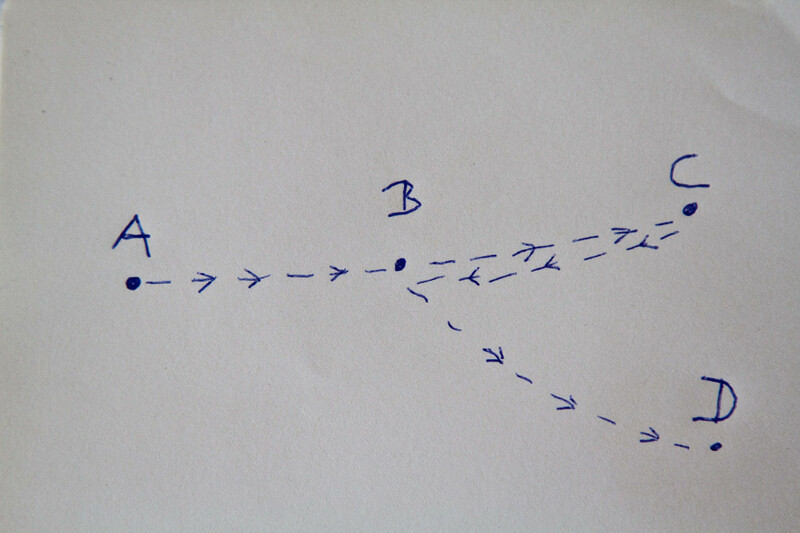 Say for instance, you would like to travel from A to B to C and then to D (see image below), you could not carry on your journey directly to D from C, but would need to backtrack to B first to then continue to D.
And then of course the vehicles themselves would not even be allowed on our roads anymore. That’s how old and partly dysfunctional they are. But apart from that, other circumstances can make a journey longer and more tiring than expected. Take our trip from Morandava to Antsirabe. We were told we would need about 8 hours for the 490 km. We were also told we needn’t stop and overnight midway, we would arrive in the early evening if we took the first bus in the morning. So, we made sure to be on time for the bus leaving at 9 am. We squashed into the bus between the other passengers that had already arrived and their luggage (which was sometimes still alive). As we already explained in a previous post, busses generally don’t leave until they are full. Unfortunately ours wasn’t full. And the bus driver wasn’t happy with the amount of passengers until about 10:40 am. By that time due to the intense scent of fish and the hundreds of flies swarming around us I had the impression of sitting on board a fishing smack…not very enjoyable! Once the engine had been started, we set off to cruise the village in search of any more willing passengers, stopping and honking again and again. Before we could really get on our way, we needed to stop at the gas station of course…I mean the taxi-brousse obviously needs gas, right?! At last we were on our way. Strangely in Madagascar when you enter or exit towns or villages there are regular police check points, where sometimes the cops will wave you through, sometimes there is a short exchange of words and a handshake (with a possible exchange of a bribe) and sometimes the police take a long look at the vehicle, the papers and then salute. Supposedly they are looking for terrorists. Anyway, in our case we were stopped three times in the first 20 minutes and our young driver did not seem to know the customs which made each stop longer than usual. After about three quarters of an hour of driving, the bus stopped in a village at a crossing. The bus driver got off, shouted around, honked his horn a few times and then grabbed his cell phone nervously mumbling. After he hung up, he said something in Madagascan after which all passengers started getting off the bus. It was now 11:30, we had been sitting in the bus for two and a half hours and we had probably put 20 km behind us. You could imagine our irritation and frustration. A lady then explained to us in French that we would make a lunch break here now for an hour while waiting for other passengers that hadn’t arrived yet. WTF?? Then another stop at a gas station, some quick shopping and a glance beneath the hood. 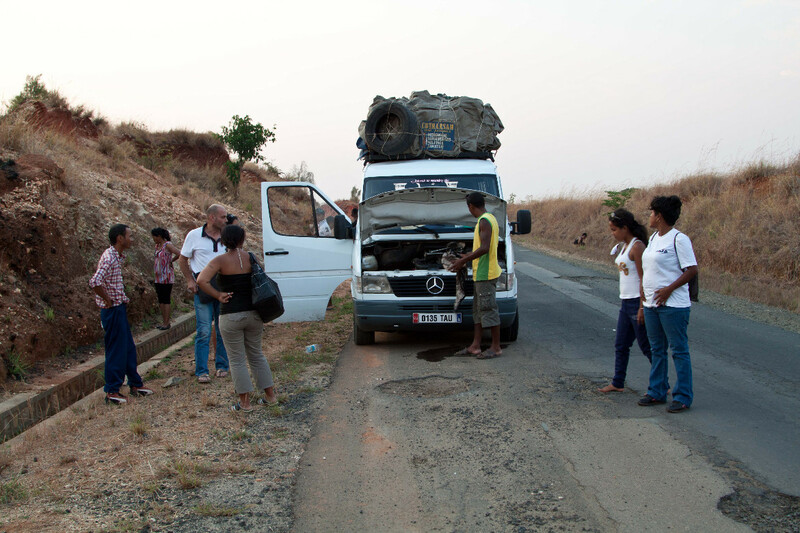 And on we went on some of the worst roads we had encountered so far….until the next stop. The bus driver stopped the engine, had a long look at his dashboard, got off, opened the hood , waited a moment, got back in, turned the key of the engine, stared at the dashboard and got off again…he repeated this procedure several times. After a while we all got off, realized the engine had gotten too hot and watched the young driver not knowing what to do apart from looking at the engine and the dashboard alternately. After about half an hour the engine seemed to have cooled off enough and we set out to continue the wonderful trip. We had several more smaller stops for reasons not obvious to us during which night fell. 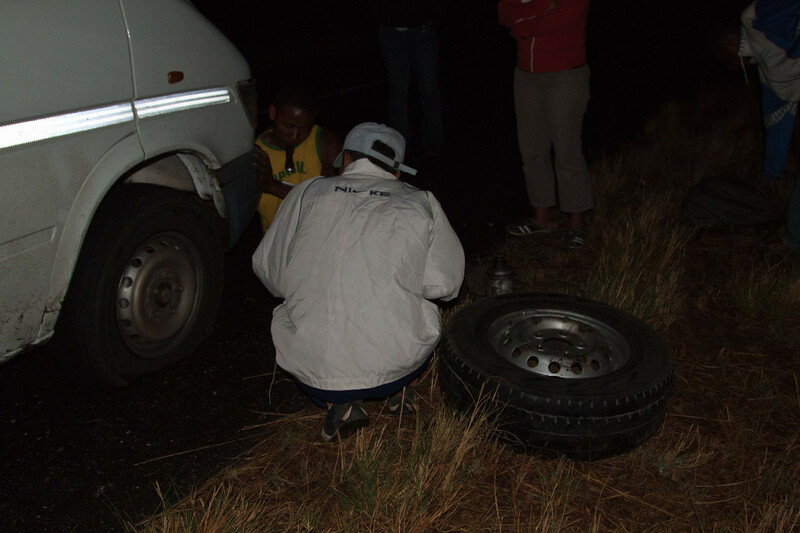 And then…we had a flat tire! I laughed, because this all seemed too much like candid camera. Instead of having everyone get off the bus, the driver took to changing the tire of the fully loaded bus. And he actually did succeed. After about 45 minutes we were driving again, much more carefully and slower now of course…and naturally without switching on the headlights to save gas. One kilometer before Antsirabe we got into another police check. I don’t know if the guy was bored but he made this check VERY thoroughly! The bus driver had to hand him papers, answer questions and open the back of the bus several times before we were allowed to finally arrive at our destination at a quarter past eleven pm, 14 hours after entering the bus. I enjoyed - I had a laugh and had to think, at least , one day you'll have lots of stories to tell your kids .........Go Kid, go!! Have a blast! Hilarious!.. And one last bit of irony - from the photo, I make out the minibus to be a German-made Mercedes Sprinter?